Quote of the day:Tell me, why is the media here so negative? Why are we in India so embarrassed to recognise our own strengths, our achievements? We are such a great nation. We have so many amazing success stories but we refuse to acknowledge them. Why? Indians are very possessive about the mango or atleast I am. I lived most part of my life in a place that really smells of mangoes. To me the best way to eat a mango is to cut it open, inhale the delicious aroma and bite into the smooth, firm flesh and feel that flavor fill your taste buds. Apart from indulging in this heavenly bliss, I try to incorporate the mangoes in few desserts, ice-creams, lassis and few more. Today`s recipe is a Mango flavored Kesari, a south Indian delight made with semolina, sugar and rightly flavored with mangoes. In a pan or kadai heat a tablespoon of ghee/clarified butter, add rawai and roast the rawai for about 2 to 3 minutes. Transfer to another plate and keep aside. In a non stick pan or kadai add water and saffron.Mix well and bring to a boil. Simmer the heat and now slowly add the roasted rawai and keep stirring continuously (make sure no lumps are formed ). When it starts to get thicker, add sugar and stir well ( it will now get to loosen up when the sugar melts ). To this slowly add the mango pulp and mix well until it thickens back to Kesari consistency. Add another tablespoon of ghee and mix well. Now add the cardamom powder. Mix well again. Finally add roasted cashews and remaining ghee and combine well until the ghee separates from the kesari and does not stick to the pan. Remove from heat and serve hot. TIPS: Fresh mango pulp is ued in this recipe. I used two mangoes and made a pulp in a juicer and used two cups of it. Store bought Mango pulp can also be used in which case reduce the sugar as the readymade pulp is already sweetened. I have used homemade ghee and used the homemade cardamom powder. I usually grind whole cardamoms with some sugar in a mixer in small quantities for later use. Since it has sugar, I have used half teaspoon. If you are using just the cardamom powder then decrease the quantity. Super. Colour is very attracting. Love it absolutely. Never tasted one like this before,sounds and looks so appealing! this is so good n very good version for kesari..
Beautiful looking and so so yummy looking. I love kesari and love Mangoes.. and I love the idea of combining them both. Never tried this before but it looks super delicious. Looks like a pretty sunshine on a bowl. yum! Such a lovely colour. Never had this before. So very tempting! 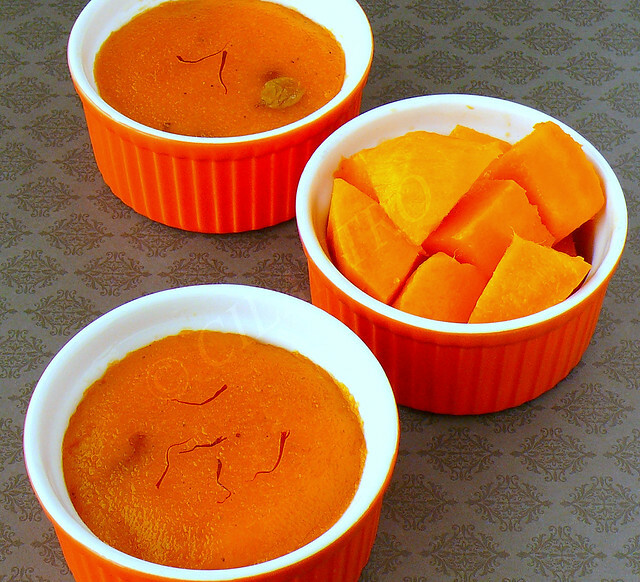 Mango kesari looks delish, havent made it though, I go for plain kesari, planning to try this for navrathiri this year!